Designed by North American, the OV-10 Bronco is a rugged, maneuverable, twin-turboprop, multi-purpose, multi-mission, light attack aircraft used by all three branches of the U.S. military as well as Germany, Thailand, Venezuela and Indonesia. 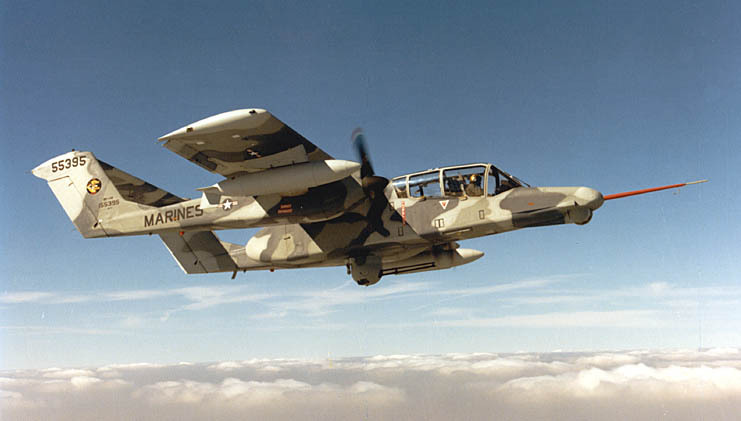 The OV-10 was originally developed in cooperation with the U.S. Marine Corps through the Light Armed Reconnaissance Aircraft (LARA) program and produced as a forward air control aircraft, performing observations, helicopter escorts, reconnaissance, gunfire spotting, personnel transport and ground attack. Faster and more tactically versatile than helicopters, yet slower and more maneuverable than jets, the OV-10 utilized tactics not possible with either. Maney Aircraft, Inc. provides modifications, avionics upgrades, electrical wiring replacement, spare parts, component overhaul, training, and technical assistance for the OV-10 Bronco. We also currently offer a Service Life Extension Program (SLEP) for the OV-10 aircraft using data developed by Rockwell’s North American Division for the U.S.M.C. OV-10 fleet. Maney Aircraft, Inc. will provide full support as long as required.